WHAT’S IT? – HealthmateForever tens unit is the best PAIN RELIEF device by blocking the pain signal from nerves. This unit has an extra-large animated backlit LCD Screen – 3.75″ (95mm) L x 2.75″ (70mm) W, which is really easy to use, especially designed for boomers, elders. FEATURES – 10 preprogrammed massage modes in a rectangle design: Stiff Muscles Numbness, Acute Pain, Stiff Shoulders, Acute Elbow/Knee Pain, Neck Pain, Swelling Calf Fatigue, Swelling Foot Fatigue, Back Pain/Lower Back Stiffness, Arm Fatigue, and Workout. Adjustable 10-80 minute timer by using “T” button, Allows 4 pads to be applied to the two different targeted areas at the same time; Uses 3 AAA Batteries; Clock style Tens unit can be standing on table. FEATURES – 20 levels of adjustable mode and intensity in channel A or channel B, you can use “A+/B+” button to increase intensity or “A-/B-“button to decrease intensity of mode. 2 outputs are isolated, so both channel A and channel B has the same 100% power, without reducing strength in half. Easy to read animated backlit LCD Display, extra-large screen designed to be easy to use for senior customers. A pause button (center button) you can click in less than a second if an emergency happens. WHY CHOOSE US? – HealthmateForever is the #1 brand for the pain relief device, which has exceed 50 kinds of Tens Unit on Amazon; ; High quality – doctor recommended; Portable and easy to use; 100 percent drug-free; Safe and effective for home use (FDA cleared & ). The device comes with 10 preset programs that makes it easy to treat various pains. HOW OUR ELECTROTHERAPY DEVICE WORKS? Using electricity technology, the device sends frequency electrical pulses to your muscles through the conductive electrode pads. Your muscles respond to the impulses by contracting and relaxing rhythmically. The contracting and relaxing of your muscles produces soothing massage sensations that are similar to that given by a massage specialist. The sensation of massage is very real. You’ll wonder who is administering your massage-but it’s just the device! It penetrates muscle group deeper than human hands can. When you place electrode pads in the pain points, you will feel instant relaxation and pain relief. Using modern human body simulation technology to simulate ancient Chinese therapeutic methods and digital programming technology, your control unit has several different massage modes. THE KIT INCLUDES: a. 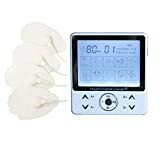 1 Double value 2in1 FDA cleared Class II OTC HealthmateForever Pro10AB2C electroTherapy device (combined TENS unit and Muscle Stimulator), b. 4 piece self-adhesive conductive reusable gel pads, c. 2 sets of dual leads wire with dia. 3.5mm plug, d. 1 Pads holder, e. 3 AAA Batteries, f. Operating Manual, g. Acupuncture placement point chart, h. Card, i. VIP Card.